We are born to move! Neuroscientists have hypothesized for years that we humans are prediction machines, we are born to move! Movement can even be seen in the early stages of gestation. The child learns by observing the mother’s facial expression(s) & fine motor cues, and learns from making errors. But still, movement is regularly neglected as a first line agent for pain & even metabolic conditions. Often replaced with pharmacological interventions. Now, one can understand that a hypertension patient would be prescribed a angiotensin converting enzyme. But, we know MORE can be done! Motivation for this blog is due to seeing more knee pathologies, and especially how correctives have been neglected for surgery as a frontline intervention. Now, I am not trying to put your ACL into excessive anterior translation (get it?). And I don’t need to discuss any sham stories. Without needing to be Wilder Penfield, you can see the highlighted blue & green regions in the cerebral cortex. 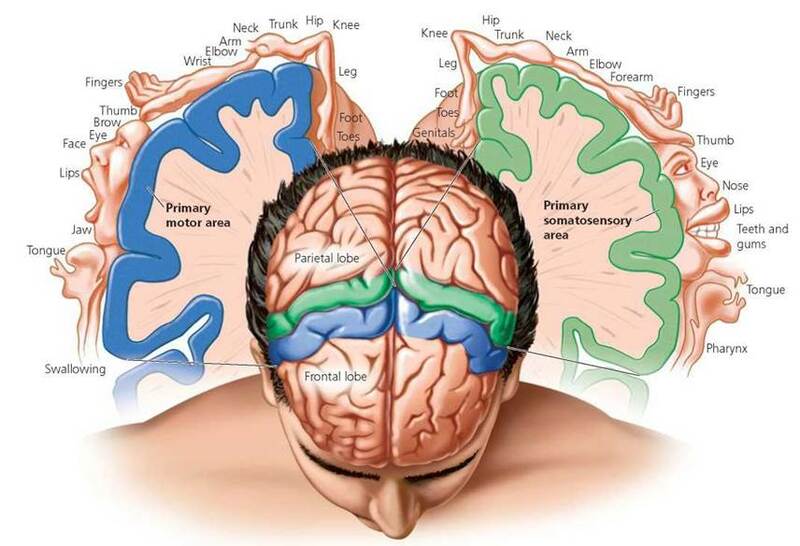 This is your motor and sensory regions in your brain! Now, it doesn’t seem like your motor & sensory areas represent a huge amount of your cortex. But if you knew (or you may already know!) that the gyri & sulci (plural) are densely packed with neuronal cell bodies, millions in fact! And if I direct you to the tonotopic organization of the motor & sensory cortex; you can see how much dedication and richness there is to regions such as the hands & lips et cetera. My argument is that are motor & sensory cortices are highly neglected as a conjunctive therapy to other modalities. One can manipulate another’s motor & sensory system to drastically improve pain, especially if there is maladaptation which is oftenly seen in chronic pain, but somehow neglected. Don’t get me wrong, touch (which is somatosensory) is fundamental for the healing, learning process. However, as humans, we are prediction machines. We hypothesize, use our narratives to justify our cognitive biases, plan, make executive decisions. Sprinkle a little dopamine in the Ventral Tegmental Area and 3..2..1..GO! I am really pushing a movement revolution!